Somewhere's abouts circa January 27, 2000 we played our first band show at Scruffy O'Shea's on the corner of Abbot Kinney and Washington. Scruffy's is now a fancy restaurant called Beechwood or something. I dunno. I've never been there. 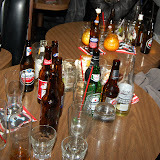 After the show, we took the money we made and went to the Brig and spent it all on booze. Now the Brig has been gentrified too. But we haven't. We'll be at the Venice Whaler on Friday with Kamikaze Red. 10pm-1am. Free! Saturday is when the wheels fall off at the Kibitz. It is Dutch our guitar player of 1 decade strong's birthday. Along with the crazy Kibitz bartender Skoty's bday too. It is triple trouble. Our once a year party there. We've all played there at least 100 times. Here are the pics from last year. I hope to see all the good and crazy people that made this last decade just that. Jon "Beachfoot" Weil, Jeff "Bad Boy" Murad, Mitchell "Hot Pocket" Robe, Jamie Douglass, John "Kone Zone" Konesky, Striker, Joshua Grange, Skip Edwards, Mitchy "Miotch Machine" Marine, Bradford Craig, Mark Watrous, Eliza James, Caitlin Dahl, Melinda Dahl, Hattie Webb, Charlie Webb, Jenn Pfotenhauer, Stutzman, Woody Aplanalp, Chris D'Rozario, Dave Roe, Lucas Cheadle, Denny Weston, Jr., Willie Chambers, Louis Metoyer, Artie Vegas, Skip Edwards, Rob Shrock, Ben Tegel, Charlene Huang, Ben Reddell, Elvis Perkins, Jonny Niemann, Stevie Tegel, Ellsworth Paxton Pryor, IVth & Eric "Dutchy" Suoninen. And all the bands we've shared billz with. Have I forgotten anyone? I'm sure I have! Remind me!